Absolut was a big winner in the product placement bidding. NEW YORK, New York -- A new, 17-minute video providing an airborne perspective of the September 11th attacks was posted to the Internet earlier today. The grainy video, captured with a poorly held camera and without any audio enhancements, depicts the destruction of the World Trade Towers. Despite the poor quality of the recording and the cameraman’s infatuation with filming everything but the towers, advertisers and retailers see a golden opportunity to market their products. Advertising agencies across the country have called copywriters and graphic designers to a series of emergency sessions to devise ads, while recklessly bidding for slots before, after, and during the video. Hummer and the NRA are savagely competing for most of the closing ad time, while Prudential, Amica and other life insurance companies vie for the 30-second spot immediately before the film. 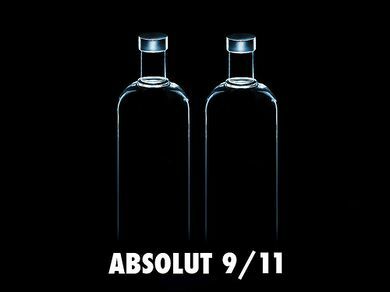 Absolut fished surprisingly deep into its pockets to secure a solid product placement, but before anyone could say something about Russian communism, Exxon-Mobil, Haliburton, and American Airlines all laid claims to several of the other prime spaces, with some running over $4 million dollars apiece. Disney and Pixar are also rumored to have secured space to advertise their newest kids' movie about a young Mother Goose, and Google bought the last few seconds to put in its search bar with the query Where did they go? World Trade Center survivors are outraged at the practice of selling airtime on such a video. Fox News, on the other hand, is outraged that it couldn’t keep up with the bidding. “We’ve been asked to create a product placement showing Snoopy flying the MetLife blimp into the North Tower," one account manager told us on condition of anonymity, refusing to specify which company his agency was working for. Already, the video has been adapted by many companies into long advertisements, both for the depiction of their own product, or the negative portrayal of their competitors'. The impact of the video is already seen in many of the nation's malls, where both families and individual shoppers are heard quoting some of the renditions and changing their shopping habits accordingly. "It's already made more of an impact on buyer psychology than any other advertisement," one expert said, "And I've seen the Old Spice commercial." Revenue from the ads alone is estimated at $14 billion, and economists say that movies, spin-off TV shows, children’s toys and other merchandise that the video produces could easily triple this amount. When asked for his input, former president George W. Bush told us, “This shows the weakness of the evildoers - they tried to change our way of life, but they failed.” The former president then returned to tending to the goldfish in the aquarium of his small Dallas apartment.